It was like flying Luke Skywalker's X-Wing on a mission to destroy the Death Star! 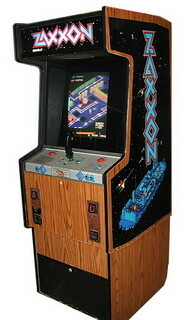 Zaxxon was a breakthrough in video game technology, achieving many firsts in the arcade world. The unique 3D perspective combined with the aircraft-like joystick was unlike anything at the arcade in 1982. Zaxxon's initial success would spawn an arcade sequel, computer and console versions, a table top version, and even a board game all within the first year of its release! Sega would also use Zaxxon's technology to create a militaristic sequel and also use the game to promote it's 3-D glasses for the Sega Master System. Even though the franchise is not as strong as some, Zaxxon's legacy remains an essential part of the 80s arcade. Zaxxon was the first arcade game to use "axonometric projection", which shows an image of an object as viewed from a skew direction in order to reveal more than one side in the same picture. For us arcade fans, it simply means...it was way cool and how Zaxxon got its name. Using your controls, you could guide your ship up/down/left/right through Asteroid City. If you made it passed the enemy guns, missiles, and force field barriers while blowing up gas tanks to refuel your ship, you faced the ultimate challenge. A large robot was waiting at the end of Asteroid City and defeating him allowed you to make your way back into outer space. After a battle with enemy ships, another city awaited. Zaxxon's technology would be the precursor to games like Congo Bongo, Q*bert, and Marble Madness. It was the first game to use shadows during game play and also the first arcade game to be advertised on television. Zaxxon initial success sparked it's only true sequel, Super Zaxxon. It was relatively the same with a faster (and more difficult) speed of play and instead of a robot, the final city battle was against a dragon. 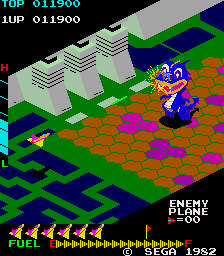 In 1984, the arcade game Future Spy was released, a Zaxxon look-a-like with a military theme. It used the same hardware, but was not an official Zaxxon sequel. Your main enemy targets were helicopters in the air and battleships in the water below. A new weapon was a torpedo that you could drop and destroy the ships in the water. Zaxxon was also released to home consoles from 1982-85. Milton Bradley got in on the hot arcade commodities and released many board game versions in the 80s, including a Zaxxon board game in 1982. Electronic game producer Coloeco also released a table top version of Zaxxon in 1983. In 1987, Zaxxon 3-D was released to the Sega Master System (SMS.) I was one of the few who owned a SMS growing up and had the game along with the 3-D glasses. It translated well into the 3-D realm with the major change being flying your ship straight ahead. This game felt even more like being in the cockpit of an X-Wing fighter in Star Wars, that is, as long as your 3-D glasses held up. Unfortunately, mine glasses did not and my SMS was "traded-in" for an NES. In 1995, Zaxxon's Motherbase 2000 was released for the Sega 32X home console. Contrary to the SMS game, it reverted to the traditional Zaxxon style of play and used 3-D graphics with a 2-D background. Overall, I think it's safe to say that Zaxxon is an important game in arcade history and defintely belongs in the 80s arcade. Wow! That brings back some SERIOUS memories. Spent many hours at the skating rink playing Zaxxon... never did learn to skate. Zaxxon was an awesome game, definitely years ahead of its time. One of my favorite games to play, even on the old C64. Reminds me of a supercharged River Raid, or another C64 fave Raid Over Moscow.